The More Things Change, the More They…PUFF PUFF! When thinking of iconic RPG franchises, Dragon Quest is one of a handful of series that immediately spring to mind. Taking top billing in its native Japan, the series has grown into a major player outside of the Asian markets as well. Naturally, a new Dragon Quest release, let alone the first single-player console entry in almost a decade-and-a-half, is a momentous occasion. Dragon Quest XI: Echoes of an Elusive Age has a lot of high-water marks to meet; 2005’s Journey of the Cursed King set a standard that each new entry has been compared against. Fortunately, this latest installment succeeds admirably in offering up a rich, satisfying experience even while managing to elude, usually for the better, the continual evolution of other series. Echoes of an Elusive Age is unmistakably a Dragon Quest title; this is evident in just about every facet of its design, from the combat system to the graphics and enemy designs, but perhaps none more important than in the way its story is structured. True to its franchise history, DQXI‘s main narrative is a fairly straightforward tale of a hero destined to seek out and destroy the Big Bad and save the world. While to the point, however, it quickly becomes clear that the game is in no hurry to rush through to its conclusion. Instead, it takes its time, slowly peppering in a boatload of side stories, often connected to the companions that join the silent protagonist on his quest. It can take upwards of twenty hours before the villain’s name is even so much as uttered in conversation, another twenty for him to show his face. 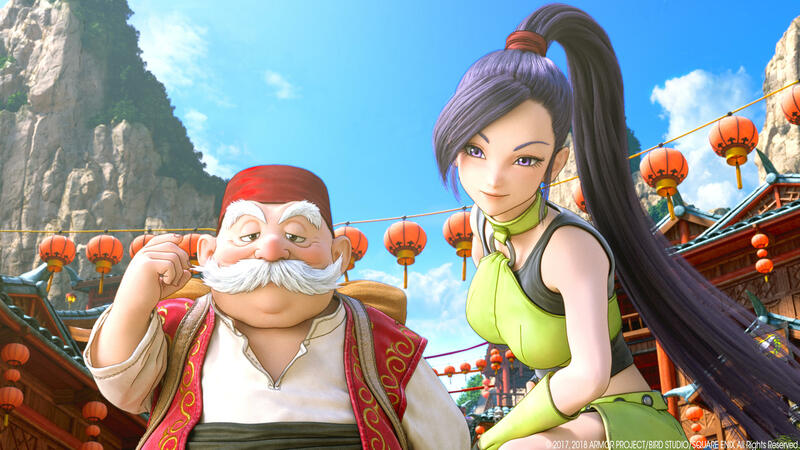 Many games run through a full narrative in the amount of time it takes Dragon Quest XI to set its stage. This is far from a criticism, as the time is well spent setting up the world and allowing the player ample time — and reason — to explore it. While the thrust of the story is a simple one, series creator Yuji Horii and his team have managed to keep it from being riddled with clichés. It comes as no shock during the game’s opening hours when the player character is revealed to be the Luminary destined from birth to save the realm from darkness. He is told to leave the village in which he was raised, travel to the nearby castle, and present himself to the king — pretty standard stuff. All the more pleasant was the surprise when the story, even this early on in what would turn out to be an eighty-hour undertaking, took a sudden left turn and began to trod a slightly different path than expected. Dragon Quest XI does this several times over the course of its story, not needlessly complicating the story but still turning a few corners many players won’t see coming. 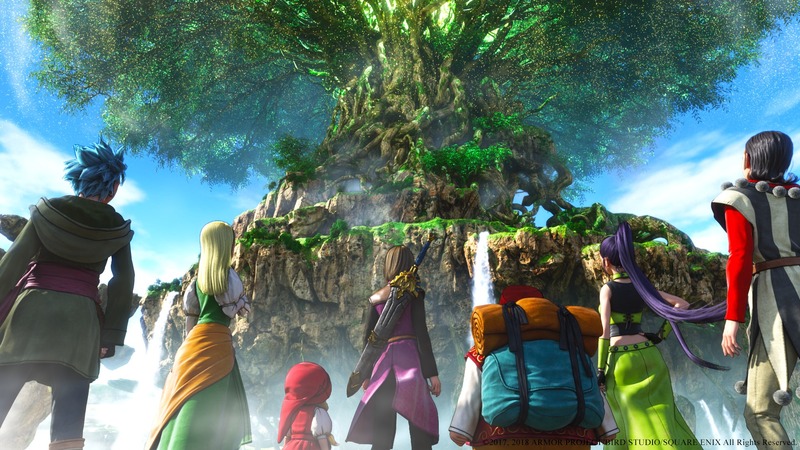 The world tree of Yggdrasil plays a major role in the goings-on of DQXI’s narrative. Still, in order to embark on an eighty-hour goose-chase, some carrots need to be dangled in front of the player. The Luminary’s story is essentially little more than a series of thinly-veiled McGuffin hunts, with the player being presented with anywhere up to eight simultaneous objectives to locate around the world. At first, the party is restricted to traveling by foot, though at certain story beats travel by sea and air become available as well, opening up new locations that were previously inaccessible. Better still is a spell acquired relatively early on that allows the player to instantly teleport to any of the game’s major locations, provided they have already been visited at least once. The real pull of DQXI lies in the stories that play out in the locations the party visits throughout their adventure. There’s a lot of variety in the various towns, palaces, and villages players will see over the course of their playtime, and the design team gets the absolute most mileage out of each and every one of them, with players trekking through the world several times over before all is said and done. Each nation in the game world of Erdrea is modeled after a different real-life culture, from their architecture down to the citizens’ accents. While this can be either a positive or a negative — depending on each player’s tolerance for national accents or people speaking entirely in rhymes or haikus — the narrative is saturated with events in each and every location one enters. Though they are often self-contained minor story arcs, it almost gives the game an anthology vibe, with an overarching story running as a connecting thread through many smaller ones. A major factor that helps bind all the game’s subplots together into one cohesive journey is the colorful cast of supporting characters that accompany the Luminary on his travels. Not only do they feature amazing visual designs, but the story beats allow each of them plenty of time in the spotlight — party members serve a much deeper purpose than simply dishing out or sponging up combat damage, particularly during the game’s latter half. 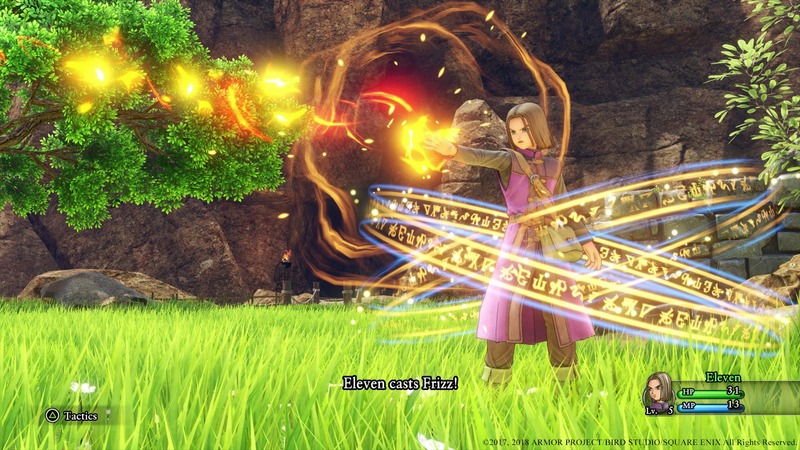 When away from the combat grind, Dragon Quest XI can be quite cinematic, featuring many story-centric cinematic scenes and giving them the chance to play out and breathe, providing some genuine moments of levity, camaraderie, and emotion, although the drama could probably have been dialed up an extra notch or two at times. Despite the Luminary being a silent leader, his backstory is interesting enough to hold his own with the rest of the cast, turning the game into a true ensemble experience. DQXI adheres strictly to established series protocols when it comes to doing battle, so veterans will need no introductions, but the absence of some modern UI conveniences is noticeable from time to time. Players can lead a combat group of four characters into battle, with an occasional fifth AI-controlled combatant joining during specific story beats. Fighters can be swapped in and out of battle at any time, with a one-turn action penalty, and equipment adjustments can be made on the fly during a character’s turn. Different weapon types feature unique properties, like targeting multiple enemies, restoring MP, etc., making frequent tweaks to the combat party necessary. Although moving and repositioning characters on the battlefield is possible, it’s purely cosmetic — combat is strictly turn-based, with no regard for proximity or offensive/defensive row positions. The vast majority of enemy types will be familiar to anyone who has ever picked up any other Dragon Quest title, with familiar designs and, of course, plenty of reskins. Even within this title, stronger versions of enemies replace their weaker brethren when certain story events require the world to be repopulated for a greater challenge. Enemies of the same type are lumped together into groups, which certain spells or abilities can take advantage of, adding a bit of strategy to the mix when selecting attacks that target a single foe, a group of them, or even all enemies on the field. It is precisely for this reason that some sort of on-screen action gauge would have gone a long way, displaying character and enemy turns, letting players set up effective countermeasures by readying their party in advance — perhaps the only gripe with the current system. With the exception of throwing the same enemies back into the game in reskinned varieties — an ailment common townsfolk also suffer from — Echoes of an Elusive Age is a feast for the eyes while keeping, once again, within series standards. The entire world is generously drenched in vibrant colors; humans and creatures feature the same stylized cartoonish aesthetic as previous entries in the series. Animations are smooth as butter, with nice particle effects during combat, and only two barely-noticeable framerate drops occurring during the entire playthrough. Don’t expect photo-realism here, but the game is optimized for excellent draw distance, textures on clothing and skin that look tactile, and even small flourishes like a convex reflection seen in a glass orb during a cinematic. When considering the traditional Dragon Quest aesthetic, it’s hard to imagine there being much room to push beyond what’s already on display in Echoes of an Elusive Age. This may be as good as it gets. The world is as engrossingly colorful as the characters that populate it. Generally speaking, the audio quality matches the beauty of the world. The many in-game cinematics are completely and expertly voiced, with particular care taken with the Luminary’s companions. The colorful cartoon designs lend themselves to a few particularly over-the-top performances, but it all works really well. The musical score also deserves praise, particularly for its slower, more emotionally stirring pieces. Such a lengthy game, however, is already bound to suffer from musical repetition, in this case compounded by too many themes being frequently reused in various locations and for a number of events. This, unfortunately, also includes some of the more grating compositions that have been thrown into the mix. Though it features some absolutely lovely pieces, the Dragon Quest XI soundtrack won’t become many people’s series favorite. Dragon Quest XI serves up a whole lot of game. The all-new Draconian Quest mode, exclusive to the western version, allows for certain restrictions to be embraced, such as being unable to flee from battles, wear armor, or go shopping, making enemies tougher and reducing experience. These difficulty adjustments may be necessary for some players, as the game is otherwise none too challenging, and only presents a few modestly-difficult battles near game’s end. But even beyond this, the narrative is deceptively long, seeming to approach a natural climax several times before deciding to turn over a whole new leaf and keep going. Even after the end credits have rolled, there’s quite a bit to sink one’s teeth into. There’s the standard “finish up side quests” stuff — which are sadly almost always dull affairs — but there’s even an entirely new optional storyline, complete with brand new villain, for those who couldn’t get enough to gleefully enjoy, pushing the game time toward the 100-hour mark. Dragon Quest XI was created by the same core team that has helmed the series for decades now, and it shows in all the right ways. Visually, musically, and gameplay-wise, Echoes of an Elusive Age is every bit the descendant of what came before. But apart from giving long-time fans a series safety net, the game is an enjoyable, well-crafted, involving, richly-rewarding JRPG that manages to stuff a ton of content into what at first appears to be a simple and straightforward affair. With a great cast of characters expertly brought to life, a gorgeous visual style, and a seemingly never-ending supply of varied story beats to experience, it is easily worth any JRPGamer’s time, and sets the new watermark for the series moving forward. Looking forward to giving this a go when it comes out tomorrow. Hope I don’t get too distracted by everything else coming out this month so I actually finish it. Very tempted. I’ve never quite managed to get into DQ so likely going to resist for this month at least with the other stuff that is more my thing, but one that’ll be on the backlog. I am, and I’ll finish the game. I’ve been avoiding as much information as possible and just looked at the score. I wanted to go in blind. I am hoping the world-design outside of the central region is a bit less canyon-y. I disagree with the cheap-treatment of the art direction. It’s technically executed well, but the choice to slap nicely-realized characters on to sloppily-textured environments, particularly the issues with materials being photographic, is a huge no-no and cheapens the visual aesthetic. This is a super-niche critique and I’d understand if people wouldn’t care about it, but I expect better from the series. It was just lazy. Then the music, which so far has been plodding, simple arrangements that feel like facsimiles of Sugiyama’s style. No complexity, short and repetitious. He’s my favorite game composer, personal politics aside, and a master of musical theory on top of that, so this is another gripe that might not be shared with many people. The reuse of old DQ music was less nostalgia-triggering and more awkward and ill-placed. Then the general interactivity is inconsistent. So far there are three barrel-models in the game. One is non-interactive entirely. One you can’t interact with in the typical sense, but it’s destructible, so it breaks apart when you run through it. One is interactive in the same way as clay pots; you can pick them up and break them for items. There’s no good reason for this inconsistency and it sends conflicting messages to the player. It also feels like there was conflict in the design teams themselves, where the environment group went ahead with their job, and someone later said “but it’s not Dragon Quest without breakable items!”, so they slapped them in as an afterthought (yet omitted other interactive environmental items, causing more inconsistency between past games). Finally, so far I don’t like the implementation of the silent protagonist here. They give the reigns over to Erik right away, and I feel like a dead shell that’s just following him on his quest. I understand, and favor, silent protagonists for player-projection, I just didn’t think it was handled well here so far. So overall the game feels like another entry to a legacy series from yore that lost it’s real meaning, and instead wraps itself in what it thinks represents the series. I chalk it up to a massive development team, lots of cooks in the kitchen, and a new generation of developers who don’t share the same pedigree as past directors. I thought DQ8 was a good modernization of the series, as it felt executed with more of a focused vision, for comparison. 9 and 10 are anomalies, the latter of which I’ve not touched at all. I didn’t write this to antagonize or argue your review! I like RPGamer’s writing and reviews, and get information here almost exclusively, but I thought I should reply since you asked, and I like critical discourse. 🙂 I do look forward to finding out what made it a 4.5 for you, as I’m sure there are some interesting twists ahead, but I am pretty disappointed so far. Oh that was so much longer than I intended. I’m sorry! Thank you for your detailed review. I’m sure I’ll play this someday! Artician articulates some of the concerns I have. I don’t really care about the graphics too much, but one thing I don’t particularly like are very easy games. Dragon Quest usually challenges you enough to actually think about your actions and consider your equipment, make smart choices with your money, etc. An option to reduce experience would be nice, but I don’t necessarily want to choose not to wear armor or any restrictions like that. For me a good Dragon Quest has you thinking about what skills and spells and element/breath protections you have. It’s part of the fun! Anyway, I’ve played every dragon quest so I’ve got to play this one also, I love them.